This entry was posted in Favorite Perfumes, Know-How and tagged Bellodgia, Caron, N'aimez-que Moi, New York, perfume shopping. Bookmark the permalink. Thank you for offering this draw ! I would say Caron has about 17 fragrances in current production without looking it up. And I am in the Netherlands, we celebrate THE kings birthday today. Happy King’s Day to you. I hope you got good weather for all the open air fun! I’ve been to Amsterdam twice and enjoyed myself both times. I was hoping to go in October but those plans have fallen through. Wow! That boutique looks so stunning. Beautiful, a bit overwhelming and luxurious. Glad you got a chance to visit the place and get a new perfume in the bottle color you like. I can only imagine how exciting it must be to see how your bottle is being filled with the precious juice. 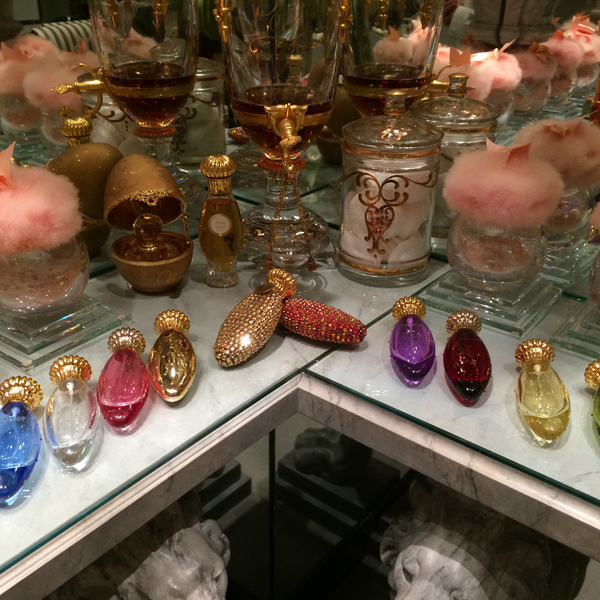 As to 3rd photo, I say there are 7 urns with perfumes. The boutique is beautiful and opulent. It really is a hidden gem. I should stop in more often since going there is equidistant from my office to my other usual midtown perfume haunts. Should I enter you in the draw, sweetie? This is a wonderful presentation of Caron. It made my morning! Photos are also beautiful. I love this house very much, but I’m more familiar with Caron’s “male” fragrances. Yatagan is my favorite. I’m just waiting for my new bottle of it. Caron has more than 30 fragrances in production, maybe 32-33. I’ve searched Caron’s site so many times. Thank you for the generous draw. I’m in Croatia. I’m glad you enjoyed the pictures. I have a decant of vintage Caron Pour un Homme which I haven’t tried yet and Yatagan, too, both from a swap. I should hunt them down! DNEM I just wanted to say how lovely those pictures are. Who’s the poor soul that gets to dust and polish all that crystal? One misstep and you’d have a big mess on your hands. I don’t know too much about Caron but I’ll guess there are a lot more perfumes than just the ones I know. I’ll say they have 20 in production. I’m glad you like the pictures. Since the boutique is located inside a spa, I would think the person doing the dusting probably had to get Zen before attempting to dust. The place was spotless! What a luxurious treat. I don’t have any experience with the line but my guess is 25 (although it’s baseless). I’m in the U.S. Thank you so much. It’s definitely a treat and a feast for the eyes! If you go to Perfume Posse, you can request Caron samples through the Perfume Fairy Godmother post which Patty usually kicks off at the beginning of each month and/or wish upon a crystal for extra luck in the draw! Lovely post and I love the green travel spray bottle you chose. No need to enter me in the draw but for Undina I’m guessing 40. I’m hlad you enjoyed the post, Tara. The green one was the nicest of the plain glass atomizers. Even though I don’t like red, the one studded with red Swarovski crystals is stunning and only available in-store. What a hidden world there on Lexington avenue…Nice to have a vicarious look in this post, and always great to read this quote of the greatest! I think Caron has 20 perfumes or so in production, and I live in the Netherlands. It almost seems like you need to be an insider to know about it! It actually took me a while to tie this post to boxing. The inspiration came with all the hoopla, at least in the U.S., regarding the Floyd Mayweather and Manny Pacquiao fight on May 2nd. And to think that Ali’s quote came from what was essentially trash-talk that boxers get into prior to and during the fight to intimidate his opponent! I am from Israel -no Caron’s to be found here…. Thanks, Irina! Caron is not widely distributed which makes visiting one of the boutiques an extra-special treat. Wow-thank you for this article, and the pictures. I think Caron has far fewer perfumes in production that people believe. I think there may only be about ten, and most of these are the newer releases. Hi Carole! The boutique is stunning! By the way, I don’t know how many perfumes are in production. The website mentions rare perfumes, with Bellodgia among them. I wonder if any of those rare bottles are still available directly from the home office. I have to ask the Brand Ambassador! Beautiful photographs! Will definitely visit the next time I’m in NY. I’m guessing Caron has about 35 perfumes in production. My favorite though, Nocturnes de Caron, has been discontinued, so I treasure my vintage bottle! I’m in the US. Thank you for the draw! Oooh, I’m envious of your Nocturnes de Caron! Definitely visit the boutique when you’re in New York but call them first so you don’t get turned away due to a special event at the spa. You’re in the draw! Good luck! I am going with 49, as I think Caron is a house that is so venerable and under the radar that there may be more in production than we know. But there again, I could just as easily be wildly out! 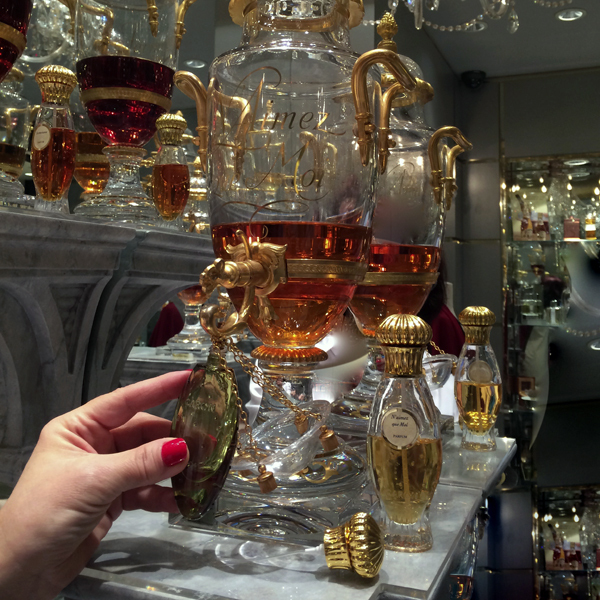 I have visited a Caron boutique in Paris – right at the start of my hobby – and was also awed by the experience. The NYC one looks even bigger and every bit as sumptuous, if not more so. As for the perfumes themselves, I have come late to appreciating the line, but Parfum Sacre is a big fave. Hi Vanessa! Even though I currently don’t have plans to go to Paris anytime soon, I’m starting to compile my perfume destinations. The boutique is actually quite small – the mirrors make it look a lot bigger. Should I enter you in the draw? No, you don’t need to enter me, and sorry not to clarify that. Based on your picture, I would guess 18 or so perfumes. Those powder puffs are so very pink and puffy! Everything about the boutique says old world glamour, to me. I am in the United States, thank you ! Nemo!!! Those puffs weigh nothing. They are so soft and I really want to get one so that I can hold it on the palm of my hand to de-stress. The boutique is old world elegant. You’re in the draw and good luck! Ha! If I don’t google it, I have no idea. :) 20? 30? That’s as wild a guess as any! Why, what’s going on mother’s day week? Or did I miss that in the story??! Thank you for this great draw. I love the photos. Am guessing 20. I live in the US. Hello Azar, the boutique is more beautiful in RL. By crikey Undina! 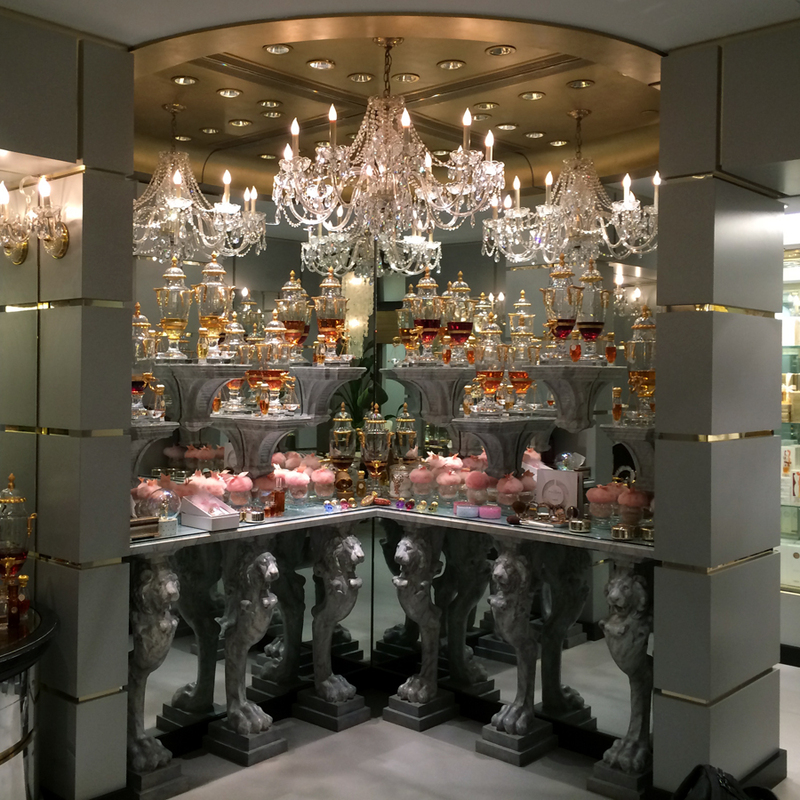 You have entered a palace of perfumery in which I one day hope to venture. I love Caron and wonder why they have never quite managed to join Guerlain in the ranks of perfumista wonder-house. My favourite is Eau de Reglisse, I think it may have been discontinued recently. Anyway, I’m in the UK, and without consulting any sources I am guessing that given some culls at the company they are currently selling 19 perfumes. Sorry I haven’t been around much recently, my latest post explains why! Hello Odiferess, It’s hajusuuri guest posting on Undina’s blog. How I wish Undina was the one who went because that would mean that she’s in NYC and I would have met her! That is too bad about discontinued perfumes,especially the one that you love. I was lucky to have acquired a bottle of Bellodgia. A secret wonderland – how baffling: all those lovely things hidden away. I’m guessing there are 16 fragrances, being Sprog’s age! 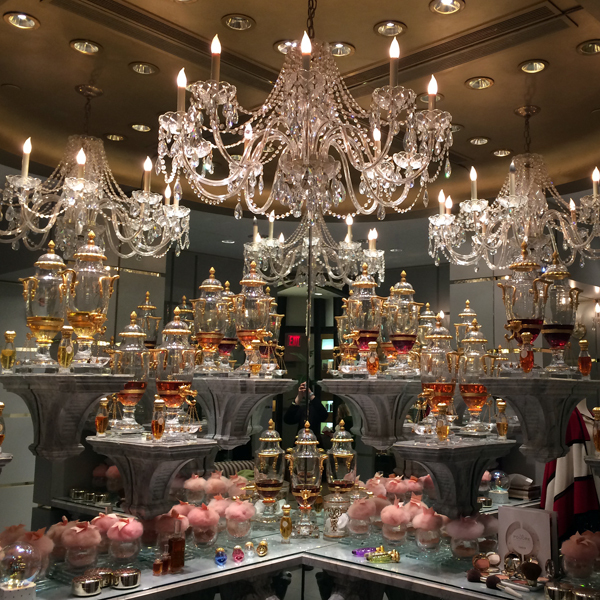 Well, it just won’t do to have hordes of people descend on the boutique but at the same the perfumes are super and the boutique a feast for the eyes. Everyone should visit it at least once! Should we enter you in the draw? I don’t want to assume you’re in Edinburgh. I was in Edinburgh in 2011 — interesting city and the Military Tattoo was quite an experience! Great post, thank you, hajusuuri! I can’t believe I walked right by that building when we went there the last time and didn’t know about that gem! When I came up with the question I didn’t check it on the website, I tried to imagine… So I came up with the number 15. What do you think? How many perfumes would you estimate in their current line-up? You picked a really good question and I see the divergent answers. My guess would be in the range of 25. I hope the Caron Ambassador replies to my email with the real answer. I also just realized the last part of Ali’s quote “The hands can’t hit what the eyes can’t see” applies really well to the boutique — its 3rd floor location with no street level sign keeps the boutique well-hidden. We definitely have to make it one of the girls’ day out destination the next time you’re here! What a delightful read, hajusuuri! I particularly loved the story about your dad taking you and your brother out of school to see Ali (something my dad would do too ;) and how you connected boxing to fragrances. I had no idea this boutique existed! I guess it’s all word of mouth or if you Googling it, otherwise how would you know it existed? Enjoyed the photos as well! I’ll pass on the raffle for now, but plan to visit the store soon! Hope you’ll write more! Hi floragal! It’s amazing, isn’t it, that such a beautiful place escaped our attention for a long time! We should do one of our meet-ups there sometime this year. That memory with my dad was special. I don’t even know how he got the tickets but he had some unusual friends although now that I think about it, he knew a professional basketball player who happened to be one of my godparents! If I were to guess, I would say Caron has 25 perfumes in production. I have only two Caron samples that I want to sniff again and again, Bellodgia and Pour un Homme, one for carnation, one for lavender, two of my favorite flowers. Both fragrances have a wonderful presence. I’m in the US. Thank you for the draw. But, oh, how that chandelier gives me a feeling of nostalgia. I want to hear that crystal tinkle. My grandparents had a crystal chandelier in their dining room. As a child I loved to stand on the table and gently tap one crystal against the other with a feather duster so I could hear that sound. My grandparents were beyond indulgent, and I am grateful for that. Thank you for sharing your adventure in NYC. Sometimes I wish I were there. Tiffanie! We guessed the same number of perfumes in production! Your chandelier story is so adorable. I would have gotten in trouble for standing on the table so your grandparents were indulgent indeed! As to the Caron samples, I’m pretty sure I have Pour un Homme from a swap, I just have to locate it in Mount Sample/Decant. Thanks for this post! I live so close (literally 7 blocks) and had no idea it was there. I’m guessing they have about 20 since that seems to be a popular idea. 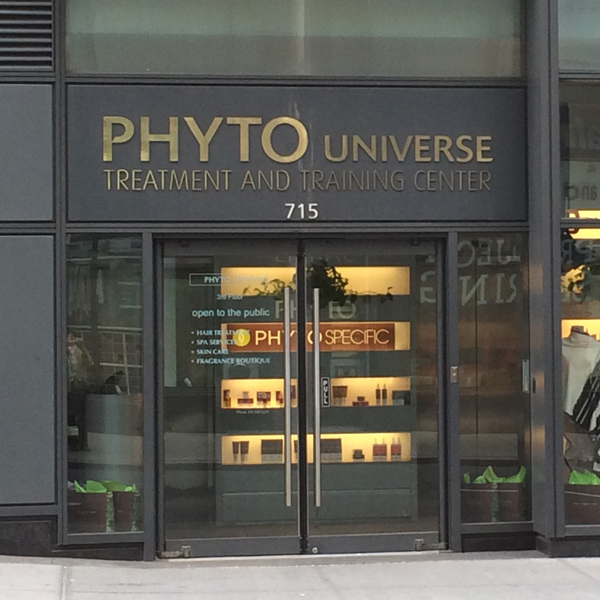 No idea, really… Am obviously in NYC. LizzieB!!! It was so nice meeting you today! It’s amazing that you live so close to the boutique and did not know about it! Oh what a lovely post, I do love some of my Carons; Aimez Moi, Parfum Sacre… And what goregous pictures, though I’m not sure how I feel about the whole urn thing, it makes it so difficult to test, because you have to involve staff, who then wants to tell you things you don’t want to know (‘this is for the femme fatale balh blah…’). I would love the chance to smell the parfums, since there are still so many I haven’t tried, so for the poll; I’m in Denmark and (without having read anybody elses answers) think there would be about 18 fragrances in all. Hello Asali! My experience with the NYC Caron is that the SA did not hover. Next to each urn is an atomizer pre-filled with the fragrance which makes it very convenient to test the fragrance. Wonderful pictures, thank you for sharing. This is one of the houses I would love to get to know, just to widen my horizon. I think they have around 20 perfumes in production now, just a wild guess! I am in Norway so it is just as likely I would sniff the Carons in Paris. I find SAs in France usually won’t let you handle the testers, but they are often very patient if they sense you are a real “amateur”. Hello Ingeborg! Visiting the Caron boutique in Paris sounds exciting. I bet it is just as beautiful or perhaps even more special as flagship stores tend to be. You’re in the draw and good luck. As an aside, I visited the Norwegian Fjords on a cruise in 2012. One of the experiences that will stay with me was breaking through the fog / clouds at the top of Mount Dalsnibba – incredibly breath-taking views! Well, nature gives another kind of special views. It is a good thing we are able to enjoy both man-made design objects of great beauty (such as those perfume urns) and nature’s displays! Haha, you made me smile this beautiful Sunday morning!